Dream Machine is a melding of varied visions of an India pale ale and an amber lager. This IPL does not disappoint. 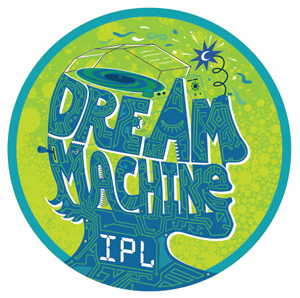 Dream Machine starts out more lager-y with subtle aromas caramel and just a hint of citrus. But at first sip, this beer becomes an IPA, with bright citrus notes assertively greeting the palate. A rounded body with a thread of light caramel and honey comes into play, speaking once again to the lager side of the equation, before another hit of hops brings about the finale. It all ends smoothly with some hop bitterness in the background, giving a nod to both styles. Sigh. Another step in the march toward the day when every hoppy beer will be prefixed with “India.” Well, the beer itself is orangey-gold with a slight haze. The foam is thin. The aroma is simple but pleasant, smelling of tangerine and lemon peels, and eschewing the dank notes so prevalent out West. The palate is clean, dry, minerally and sharpish, with a finely focused bitterness. Hopheads won’t be losing their minds over this one, but this beer will be a great crowd-pleaser for summer cook-outs, and that’s something that never gets old.